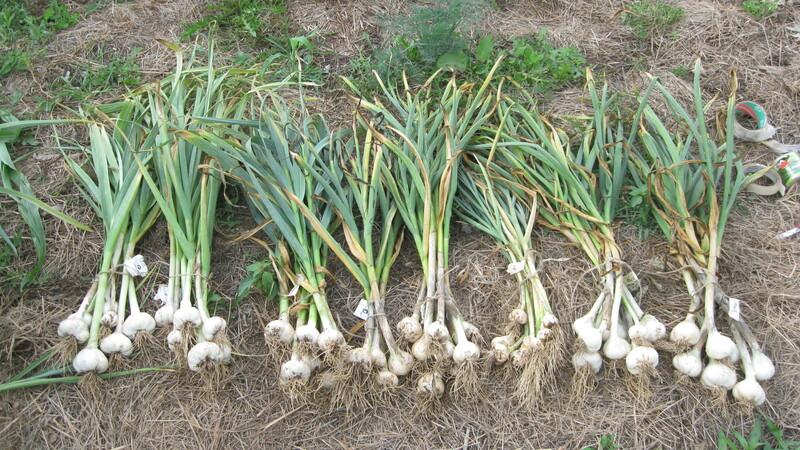 Last fall I ordered several varieties of garlic through the USDA’s Agriculture Research Service germplasm database called GRIN (http://www.ars-grin.gov/). They offer thousands of varieties of fruits and vegetables in seed or cutting form to be grown out for research purposes. I had found out about this resource in an Ethnobotany class I was taking and decided to try it out. Fall was approaching and I started thinking of garlic and browsing through the very long list of garlic varieties available. I ended up picking out seven varieties from around the world, and I won’t lie that I picked some of them based on their awesome names, such as Ukrainian White Inferno, or Georgian Fire. My plan was to plant these different varieties and determine which ones would grow well in my climate and soil. I put the order in and planted them in the fall. About a week ago I harvested them and took note on how each variety did. I found that the varieties from Ukraine, Georgia (the country), and Italy did the best, while the ones from Spain matured early at a very small size. Keep in mind I only had one variety from each country and many more varieties could have been tested to determine which varieties came from similar climates. This summer I read a book by Gary Nabhan about a Russian man named Nikolay Vavilov. Vavilov was a plant explorer and botanist who in the 1930’s traveled around the world collecting hundreds of thousands of seeds. He identified several centers of origin of agriculture where a wide variety of crops were domesticated and selected for over time. He also took note for the first time that in these places where crop diversity was high, natural biodiversity and cultural diversity was also very high. With the seeds he collected and brought back to Russia he created the Vavilov Institute of Plant Industry, where the crops were grown out and tested to see which ones would grow well in Russia. He also was interested in using the cultivated varieties from the around the world for breeding material as well as some of the wild predecessors to modern crops. Vavilov was imprisoned by Stalin in the 1940s because he didn’t agree with Vavilovs methods for developing crop varieties. After years of neglecting Vavilov’s theories and work, Russia suffered greatly in the agricultural realm. Vavilov’s collections survived through the turbulent political climate in Russia over the years due to the passion and dedication of his students and followers. However, they are still in danger of falling to the wayside, as so many seed banks in economically unstable countries. Organizations like the Global Crop Diversity Trust are working to protect these precious collections of genetic diversity (http://www.croptrust.org). Now through germplasm banks such as the USDA’s GRIN we can access genetic material and trial varieties as small farmers. I think it is very important to do this to increase the genetic diversity in the crops we grow, since it has been on decline since the industrialization of agriculture. These varieties from all over the world have adapted to a vast range of environmental conditions and contain the genetic resistance to climate stresses, pests, and disease that we may need to adapt to our own changing environmental conditions.